Built on Microsoft Dynamics 365, Velosio Connected Intelligence uses the power of AI technology and the Microsoft Intelligent Cloud to make CRM work for executives, managers, and sales teams. Connected Intelligence delivers better user adoption, revolutionary process automation, and actionable business intelligence. Our solution simplifies the CRM experience and provides everyone in the organization a greater level of clarity, transparency, and confidence in customer information, opportunity and pipeline status, and forecast accuracy by virtually eliminating manual data entry, subjective assessment and scoring, and static analytics. Connected Intelligence continually pulls data and captures business intelligence from emails, events, and documents across your organization. It adds new and enriches existing accounts, contacts, opportunities and leads with engagement insights. Connected Intelligence delivers insights based on algorithmic-based analytics through role-based dashboards and in-context insights, providing objective views into relevant data. This gives you clarity and visibility into customer value and buying behaviors, opportunity probabilities and timelines, sales pipelines, team and individual performance, and organizational KPI’s. Connected Intelligence is built for Microsoft Dynamics 365 and is native to Microsoft Azure. It is easy to deploy, simple to configure and manage, and unique in how it can virtually eliminate the cost and complexity of deployment and integration. Inadequate Resources: Insufficient resources are allocated to business process support and improved usability. Limited Adoption and Participation: CRM usage is restricted to sales and service teams who have limited motivation to use the system. Insufficient Data: Data entry and integration obstacles and challenges minimize the volume of usable information in the system. 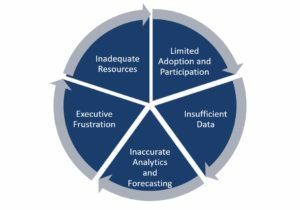 Inaccurate Analytics and Forecasting: Analytics and forecasts are based on limited data, static criteria, and biased assumptions. Executive Frustration: Executives cannot get insight into the customer journey, are unable to get visibility into key performance indicators, and lack confidence in pipeline reporting and revenue forecasts. Ongoing Investment: The CRM system is perceived as a vital resource for strategic planning and execution. Active Participation: CRM is integral to work processes and provides value to sales teams and managers. 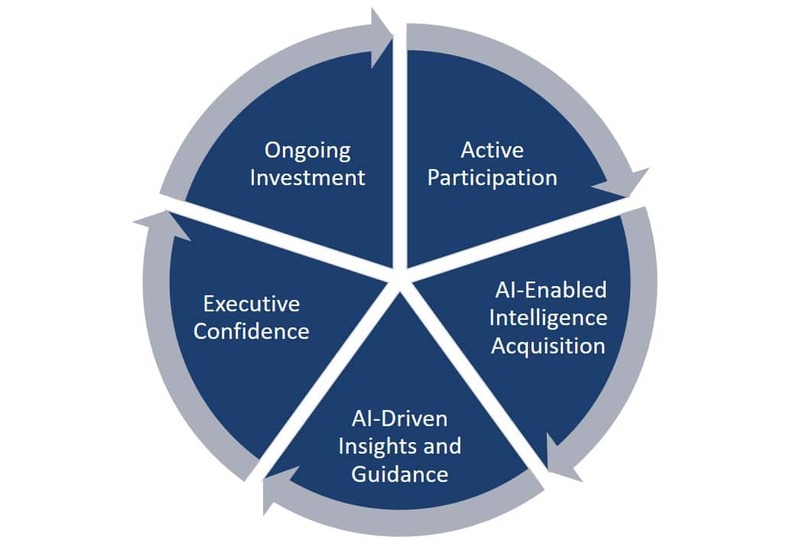 AI-Enabled Intelligence Acquisition: Comprehensive intelligence is automatically collected from customer and prospect interactions across the organization. AI-Driven Insights and Guidance: Algorithmic-based analytics are delivered through role-based dashboards and process-driven, in-context insights. Executive Confidence: Executives get clarity and visibility into the business and accurate forecasts for planning and budgeting. Connected Intelligence crawls Microsoft Office 365 or Exchange, Dynamics 365 and LinkedIn, retrieving all data related to leads, customers, prospects, and opportunities including emails, meeting details and documents. New contacts are intelligently associated with leads, accounts and opportunities. Leads, contacts, accounts, and opportunities are automatically enriched with relevant data and activities. Leveraging AI and machine learning, the system continuously analyzes vast collections of customer interactions which are organized, assessed, and scored based on dynamic, objective criteria. Users view and work with real-time intelligence through role-based dashboards – designed for Team Members, Sales Managers, and Executives – including interactive charts and visual filters. Sellers are enabled by powerful search and email tools plus intelligent playbooks providing on-demand, actionable and in-context insights recommending actions to maximize sales efficiency and personalize customer journeys. A complete solution providing automated, organizational intelligence acquisition plus intelligent insights and guidance. Extends the solution with advanced machine learning to support dynamic adjustment of value calculations and algorithms.